What are the hottest wedding hair ideas for 2016? If he put a ring on it, honey, then start planning for your special day! Once you’ve found the perfect dress, it’s time to seriously consider your hair and how you will wear it. 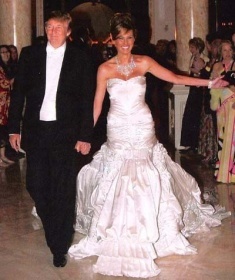 Celebrities and reality TV stars all seem to get it right on their wedding day. Copy their look! 1. Long hair, wavy ends. Amal wore her dark, side-parted locks cascading down when she said “I do” to dashing George Clooney. 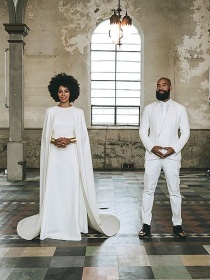 Solange Knowles married director Alan Ferguson with non-traditional hair. She rocked her natural Afro, causing a buzz of opinions. Tiny dancer Nicole Richie wore a sleek ballerina bun when she wed rocker Joel Madden. 4. Demi-chignon, voted best wedding do. 5. Center parted, floral adornment. Keira Knightly stepped out with husband James Righton displaying a ring of flowers in her hair following the ceremony. NeNe Leakes remarried husband Greg wearing a super-cropped cut reminiscent of Halle Berry’s 2010 spiky pixie. Kim Kardashian displayed 1970’s bridal tresses in “I do” to Kanye West. Stylist Chris McMillan copied Ali MacGraw from Love Story. 8. Elaborate chignon, movie goddess. In Kim Kardashian’s 72-day marriage to Kris Humphries, she wore hair pulled back with a dangling diamond headpiece. Khloe Kardashian’s California girl hair, complemented her Vera Wang gown as she wed Lamar Odom. Liz Hurley’s elaborate marriage ceremony to Arun Nayar couldn’t keep them together, but she looked model-flawless. Halle Berry wed Olivier Martinez at a French chateau wearing a white dress and pixie do. Jenny McCarthy married Donnie Wahlberg with scarlet lips and starlet curls. 13. Gentle waves, honey blonde. Ivanka Trump wed Jared Kushner in glamorous hair tucked behind one ear. Melania Knauss married billionaire Donald Trump in a classically chic, elegant bun. 15. Hair behind one ear, glamorous barrette. Sofia Vergara looked like a fairy princess when she wed handsome Joe Manganiello. Iconic Cindy Crawford’s honey-brown hair flowed in the breeze at her beach wedding to Randy Gerber. 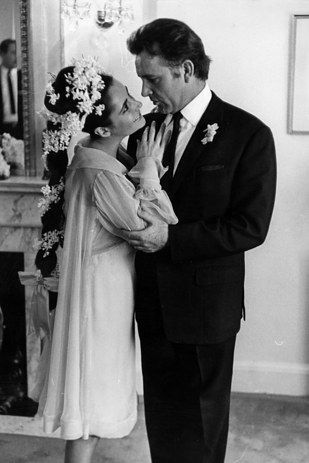 Liz Taylor first wed Richard Burton in a floral goddess headpiece and bun. The wedded bliss between Kate Beckinsale and Len Wisemen is over, but she rocked multi-loose curls. 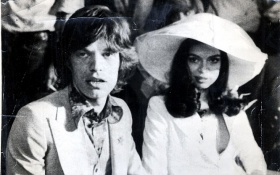 Bianca rocked a smooth flip under a big, veiled white hat when she married Mick Jagger. Sophie Hunter wore Valentino and soft waves when she wed Benedict Cumberbatch. Follow us on Pinterest or Instagram.